Today the forecast said 35 to 40 knot winds, so I stayed in Bamfield again. It has been nice to repair a few small tears that needed sewing and get a hot shower. I have been thinking about the the trip so far and what I have been learning. On night 5, I stopped at the well-named Thrasher Cove. Despite having a decent weather forecast I planned on taking the next day off. My shoulders and forearms had been sore, and I was concerned about aggravating an old repetitive stress injury. I also had the hint of a cold since the first night. The biggest reason, though, was the blisters. I had upwards of eleven blisters spread across both hands for three days. I could still paddle, but it is quite painful to lug bags and the boat up and down the shore. I have not had this happen before, even with the same hand gear and paddles in similar conditions. I was doubting if I had made the right call that evening. Should I have kept going? I had made such good time all day and there was still plenty of light when I pulled into camp. Should I take advantage of the fair weather and move again the next day? I went to sleep unsure if I should really take the day off. I woke up at my usual 4am and just rolled over. 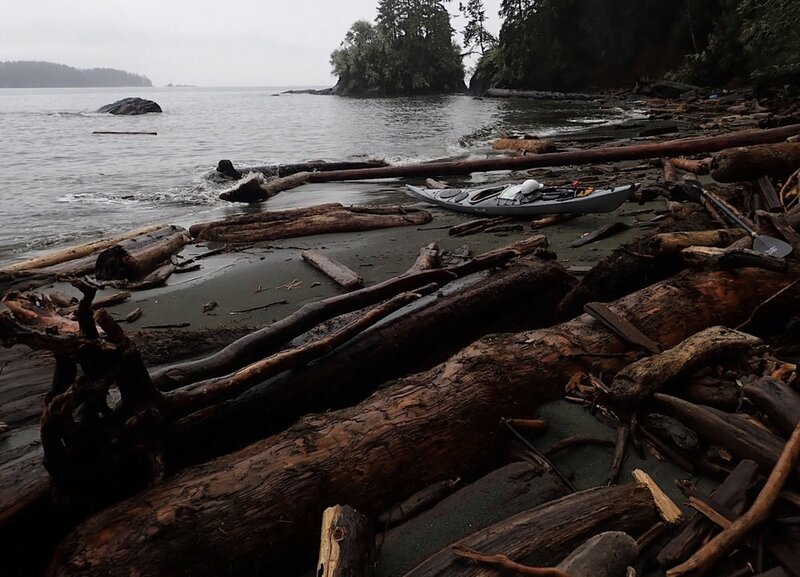 There was a clear signal from my body saying, “This is going to be a rest day.” I slept in and spent day 6 relaxing, planning the next couple days, writing, and enjoying just staring at the waves tossing logs around the beach below my tent. By the end of the day all the blisters had subsided and nearly all were no longer tender to touch. Overall I was feeling rested and ready to head out the next day. I had made the right decision to stop. Really, this is about risk assessment. When I coach kayaking students I always talk about assessing risk. We look at how factors such as the wind, waves, temperature, landings, group ability (etc., etc.) are affecting the amount of risk we are assuming by getting on the water for the day. We often plot these things out to have an objective way of deciding if a plan is sound. But it is always for that day, or that leg. I find myself having to think things through on a longer timeline now. The risk isn’t just about today, it is about the entire expedition. Plotting out the factors for risk... it was a go, but barely! I received some advice from Ken Campbell, who attempted this trip in January of 2008. He told me, “You have to be patient. This is a long trip.” I am starting to understand that better now. Deciding to stay to heal when I could have paddled was not about that day, but about two weeks from now. I will only get through this if I am in good health. I have to be patient with myself as my body gets used to 4:30am wake-ups, perpetually cold and wet hands, and the feeling of being sore but not hurt at the end of each day. I try to remind myself that I DID prepare well, but the only way to really get used to paddling a fully-loaded kayak and living in constant 40 degree wetness is to do it for a while. It is hard to be sure, but I think I have adapted pretty well during this first section. One thing I am certain of is that the beauty and solitude have been well worth the troubles. Tomorrow I am off to Ucluelet, then Tofino on Saturday if the weather holds. I will try and post again before heading out into the northern section, where I am sure to not find any cell coverage and very few opportunities for updates. Older PostHello from the Coast!